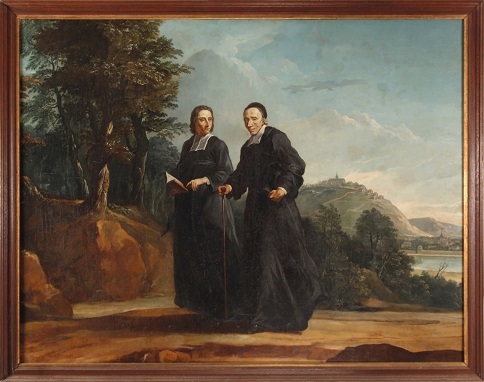 Last December this painting by Jean Restout was auctioned in Rouen, with an estimate of between €20,000 and €25,000. It is variously titled "The abbé Tournus in the company of the diacre Pâris on the road to Port-Royal" and "The pilgrimage of piety". The subject was previously known from a fine engraving by G.F. Schmidt, but the original painting is newly discovered. It had apparently belonged to the same family in Haute-Normandie for several generations and was found hanging on their stairs by a member of the auction house, Delphine Frémaux-Lejeune. I haven't managed to find out who bought it. The picture provides further confirmation of the close ties between François de Pâris and other members of the Jansenist "resistance". The abbé Louis-Firmin Tournus (1672-1733) was his close associate. The biographies at first referred to him only as "Monsieur Louis" but the 1743 edition of Doyen identifies him by name and reproduces an obituary from the Nouvelles ecclésiastiques for 1734. 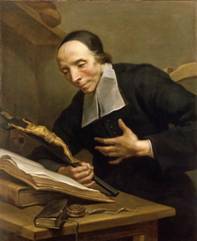 The abbé's life of penitence, prayer and fasting closely paralleled the deacon's own. In 1715 he had renounced his parish in the diocese of Agde and come to Paris to live among the Jansenists at the seminary of St. Magloire and the community of St-Hilaire. According to his obituary, in 1721 Pâris sought him out, knocking on his door, and inviting him to join with him in a life of penitence. The Testament names Tournus as a close friend who has "edified him by his instruction and his example"; Tournus inherited Pâris's library of 200 books. 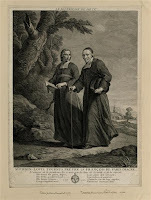 In 1729, after the deacon's death, Tournus set up a new community with the abbé Gaspard Terrasson and Charles Lajus (aka M. Sylva) The three lived for some time in retreat at Notre-Dame de la Gorge in Savoy in the foothills of the Alps. Both these men were involved in the publishing enteprises sponsored by the Jansenist magistrate Carré de Montgeron in the 1730s. On his return to Paris, Tournus himself was spiritual adviser to the Montgeron family. He died in the Jansenist community of St. Josse in 1733. The artist Jean Restout was a well-known painter of religious subjects. He came from a family of painters from Rouen and was one of eleven children, at least three of whom were professed monks. He was received into the Royal Academy of Painting in 1720, and worked mainly for the regular orders. 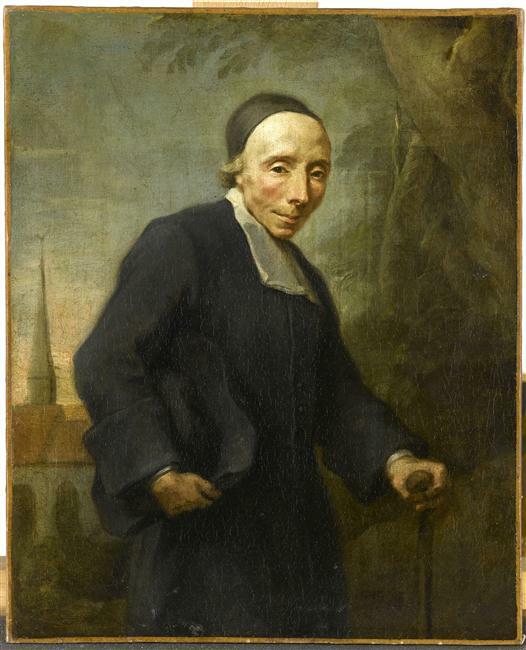 He had come into contact with Jansenist circles through the intermediary of his uncle and mentor the history painter Jean-Baptiste Jouvenet (1692-1768) There are other existent studies of the abbé Tournus in various collections, including the Carnavalet and the Musée de Port-Royal. He also painted a deathbed scene of the diacre Pâris with his brother Jérôme-Nicolas - who in all probability commissioned these various portraits. Notice for the sale: Normandy Auction, 13th December 2015, Lot 43.